Once you have decided you would like to use our GC150 pump exchange service you need to read all the information on the product page , then you can simply click on the Buy Button & follow the on screen checkout. After you have completed the checkout process you will be sent an email confirming your order, you will then need to package up your old GC150 pump using a strong box with plenty of robust packaging. We recommend using double wall cardboard & large bubble wrap if you have it. Please then download and print out our address label & form and fill in your details as requested, then fold the paper over on the fold line mark and stick to the box or inside a document wallet. If you need further advice on how to un-install your pump from your spa then please either use one of our help articles or phone us on 01326 371488 where we will be happy to advise. Contact us to arrange a collection. Now that your old pump is all packaged up its ready to go! at this point please either phone us on 01326 371488 or email info@hydrospares.co.uk or use our contact form to let us know so that we can arrange a collection. Please advise a day which best suits you for collection. Our couriers cannot specify a time of day for collection so please choose a day when some one will be in. If everything is OK with your pump, and it is suitable for the exchange, we will then complete the process as quickly as possible, normally within 1 week depending on how busy we are. 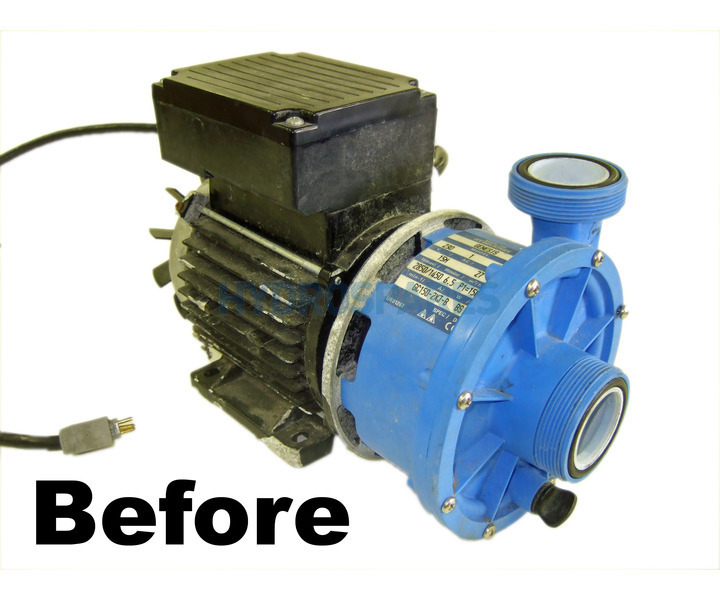 The process starts with us removing the Wet-End and electrical lead from the old motor which we then discard. After which we also remove the old seal from the impeller and back casing. After a quick clean of the Wet-End components we install the new ceramic seal parts. We then fit the Wet-End back casing on to the new motor and install the impeller on to the motor shaft. We then prepare the front Wet-End face plate O ring with silicone grease, which we install onto the faceplate. After fitting the face plate onto the Wet-End, we also install new port O rings. All we have left to do now is install your existing electrical lead with a plug (usually a grey one called a JJ plug). After all this work is done we set it up for a water test, which usually lasts for about an hour, just to make sure its all running OK.
We will then contact you to advise that everything is complete and the pump is ready to be shipped back. Once you receive the pump back please inspect it for transit damage straight away, you must advise us of any damage within 24 hours of receipt. All you have to do now is install the pump back into your spa, once again if you need a little assistance we are always at the end of the phone to help out. Your Hot Tub should now be up and running again. Please don't forget to leave feed back on our website using the product page and as a reward we will send you a 10% discount voucher for use against your next order.